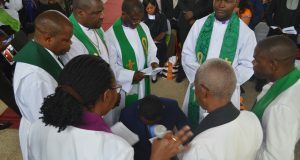 The United Church of Zambia Synod Executive has appointed Rev. Kapembwa Kondolo as Principal of the newly established UCZ University College. The appointment of Rev Kondolo is for a period of four years from 1st January 2014. The UCZ University is based at the Mindolo Ecumenical Foundation in Kitwe. Before his appointment, Rev Kondolo was Lecturer in African Studies and Dean of Student Affairs at the College. He takes over from the Rev Dr Musonda Bwalya whose term of office came to an end. The University College offers Bachelor of Theology degrees and intends to start offering degree course in other disciplines such social science, business and agriculture. 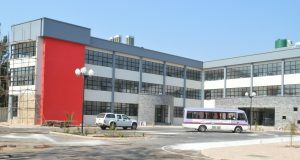 The Chipembi College of Agriculture is a faculty of the UCZ University College. The Synod Executive which met from 3rd-4th November 2013 at Diakonia Centre in Kabwe also appointed Reverend Jonathan Kangwa as registrar and lecturer of the UCZ University College for four years with effect from 23rd September 2013. Before his new appointment Rev Kangwa was a minister of the Word and Sacraments in Muchinga Presbytery. The Synod executive has also appointed the Rev Mary Mwiche Zulu as Dean of Faculty and lecturer at the University College for four years with effect from 1st July 2013. She previously served as a minister of the word and sacraments in Ndola South Consistory on the Copperbelt. Other appointments are those of Mr. Innocent Kangwa as Synod financial Secretary for three years with effect from 1st August 2013 and the Rev Dennis Mbita Sikazwe as Communication Secretary for four years with effect from 21st October 2013. Mr. Kangwa was acting financial Secretary prior to his appointment while Rev Sikazwe was Head Librarian and Lecturer at the UCZ University College. Mr. Rodgers Ng’ambi, Administrative Secretary had his contract renewed for three years with effect from 10th November 2013. The Synod Executive also stationed and transferred 10 ministers. 8 licentiate Probationers and 3 diaconal workers. 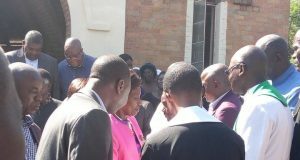 The following ministers were stationed in Lusaka Presbytery: Rev Brian Kalobwe, Rev E. Bwalya, Rev Rosemary Nachilembe, Rev Serge Changa and Rev O.Mukalu. Reverends Kuzipa Nalwamba, Joseph D. Simukonda, F.M.Simukonda and G.Chilongo were transferred to the Copperbelt, while Rev Gift Kyembe has been taken to Central Presbytery. On the other hand the licentiate probationers who had completed their training at the United Church of Zambia University College were stationed as follows: Thomas Phiri, Genesis Siulanda and Danny Muonga were stationed in Eastern Presbytery. Joseph Nkonde and George Manda were stationed in the Northern Presbytery. Saviour Chipendano was sent to North western. Luapula and Muchinga presbyteries were given Brian Mbale and Douglas Chisenga respectively. As for Diaconal workers Febby Chisenga Chella was stationed on the Copperbelt while Shallotte N. Chisenga and Gloria Chomba were stationed in Northern and Luapula presbyteries respectively. At the same meeting Reverends Eve Mulenga Lumano and Samuel Kabwe were both seconded to Zambia National Service as Chaplains with effect from October 2013.